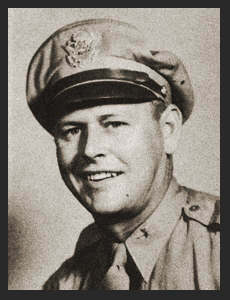 Maj. Clyde H. Amyx, son of Mr. and Mrs. Ed Amyx, attended Loveland schools; husband of the former Audrey Robertson. Entered the Air Corps in Feb. 1941, trained in San Francisco, Ontario, Cal., Moffit Field, Luke Field, Ariz.; served in Guam, Luzon, the Philippines, Okinawa, Iwo Jima, Australia; served in Washington, D. C. Awarded Asiatic Pacific Ribbon. He was awarded three Battle Stars, Am. Defense Ribbon, Victory Ribbon.